I am PROUD of these young giants! The Dream Defenders, a group of student activists in Florida, aren't deterred by Gov. Rick Scott's outright refusal to hold a special session on the Stand Your Ground Law that allows individuals like George Zimmerman to claim self-defense after murdering 17-year old Trayvon Martin in Sanford, FL. They have taken the fight straight to the chest of lawmakers! Since Tuesday, July 16, they have been conducting a sit-in of Gov. Scott's office in the Florida State Capitol. They have been joined by Civil Rights icon Rev. Jesse Jackson and global humanitarian Harry Belafonte. "We are calling on the governor to convene a special session of the legislature to enact the trayvon’s law to repeal stand your ground, ban racial profiling, and end the school-to-prison pipeline. On Thursday, July 18th, the governor finally met with us, but provided no real leadership. Rather than calling for a special session, he is calling for a statewide day of prayer to end racial profiling. But faith without works is not justice," the group says in a statement posted online. "We are taking a stand not only in trayvon’s memory, but for our worth as people and citizens of Florida. We cannot allow Gov. Scott to neglect his responsibility to protect the safety and well being of all Floridians. We are here until our struggle for justice is won. And if we are to keep moving forward, we need your support. Our occupation is full of love and joy — but is short on some vital supplies. Your support is needed to help us fill these needs." 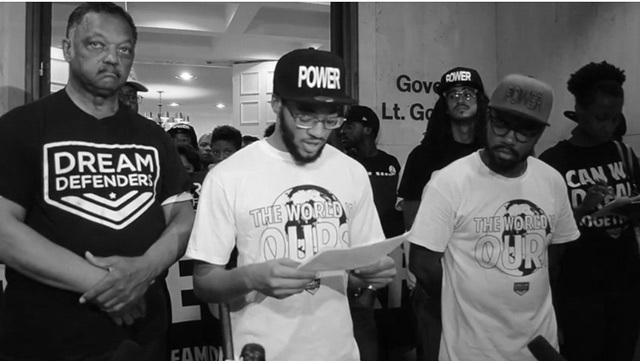 Read more of their demands and pledge support @ http://dreamdefenders.org/. Also, watch the video below as they stand their own ground to repeal the controversial protection law that begets violence.